Radek Bednarczuk, from Poland, has been keeping freshwater tropical fish for 17 years and for the last 8 years he has primarily been keeping and breeding South American cichlids. He has collected cichlids in their natural habitat, mainly Geophagine cichlids, Apistogramma and Discus. 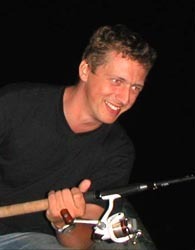 Radek writes about fish and he also is an accomplished fish photographer. His homepage can be viewed in http://www.radbed.com.